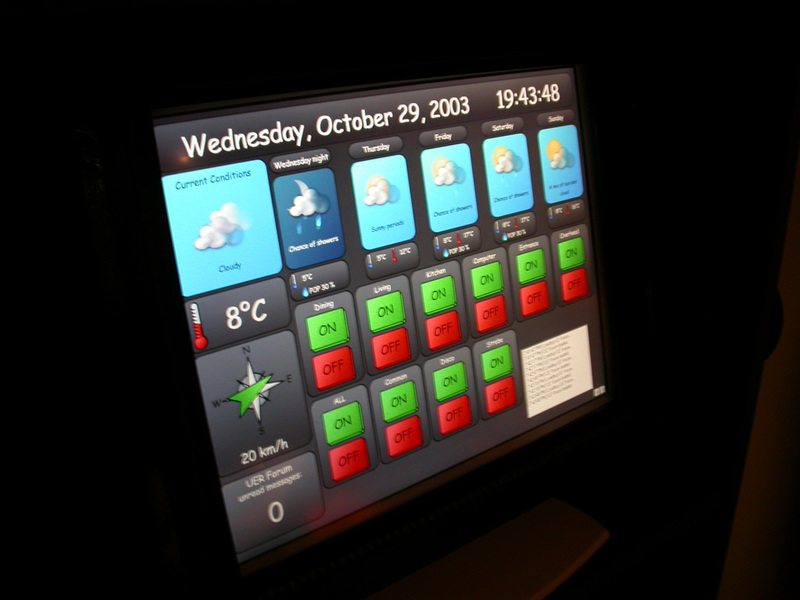 As you might expect from the name, using the touchscreen is as simple as touching it. Previously, I turned a regular 15 inch LCD monitor into a touchscreen by purchasing a serial touch controller from a local surplus store for about $130. I attached it to the front of the monitor with some clear packing tape. The touch controller is clear, and simply provides a surface you can touch, while seeing the display through the surface. The monitor that was behind the touch controller died a few years ago, so I found a proper 15" LCD Touchscreen monitor for about $250. This has replaced my old homemade touch setup and it works very well! 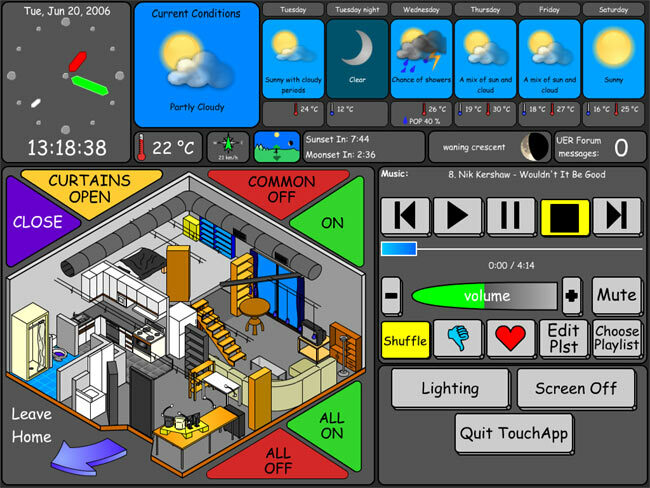 The touchscreen computer (hidden behind the bookshelf) runs custom software called AvTouch. A Flash front-end is used for the graphics, with a more powerful application back-end. A 24-hour clock gives the current time and date at a quick glance. This display tells me the current weather conditions, temperature, and wind speed and direction. I've found this to be an invaluable tool: I will often glance at it and decide if I should wear a jacket or not. I use the wind speed / direction display when I am cycling or rollerblading, because if the wind is going against the direction I will be going in, I might want to take an additional drink to keep me cool. If you touch the current temperature display, a temperature log for the last 24 hours, week, month, or year shows up! A great way to judge the rest of the week. There's some 40-odd animated weather icons, and they look fabulous! Should I bring a raincoat, or should I plan something outdoorsy this weekend? It's like having the weather channel on, 24/7. I find myself using the "highs" and "lows" the most (the temperatures in red and blue). If I'm going out for the day, and it's going to be really hot, I know not to wear heavy or dark clothing. If you touch one of the forecast days, a text forecast appears, which often gives information such as windchill, UV Index, and more detailed information. It's always good to know information about your favourite celestial objects: The sun and the moon! The small graphic (seen enlarged on the left) is the Sun & Moon Map. It shows the current season via the tree, which changes to a bare tree in the winter. The current position of the sun in the sky is shown, along with a matching shadow on the tree. 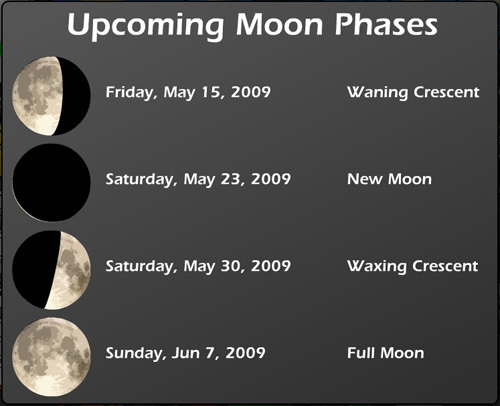 The current position and phase of the moon is also shown. Many people don't seem to realize that the moon rises and sets on a schedule that is independant of the turning of the earth -- some nights there is no moon at all, and sometimes during the day, the moon is out in full force. Using this graphic, you can tell when you'd be able to see the moon during the day or at night. In case the graphics are too confusing, the information is also presented in text form, with hours:minutes until sunset, sunrise, moonset, and moonrise, depending on which comes next. A simple box that shows the current number of messages waiting on one of my websites. It flashes and makes noise when new messages arrive, and I can touch it to see who the message(s) are from. This is one of the most interesting features on the touchscreen. An interactive map of my home. 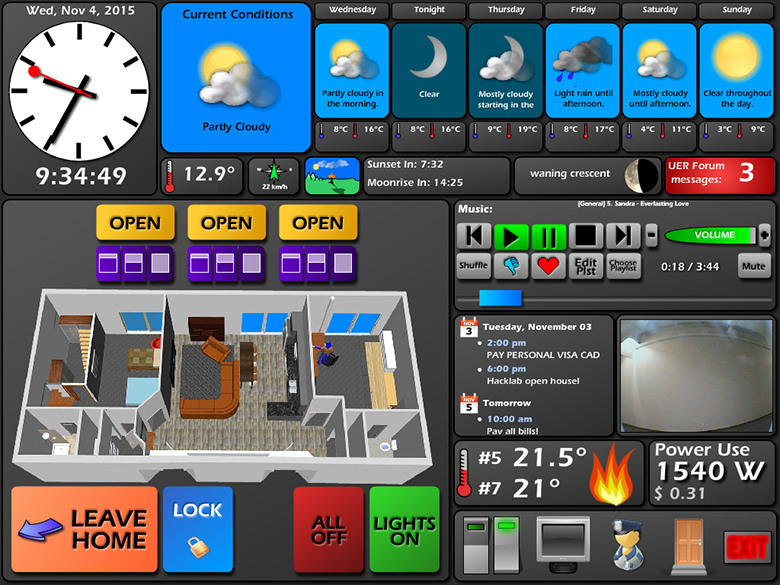 Many of the automated or controlled appliances and lights are shown. You can tap the various parts of the map to turn on or off the lights in that location. 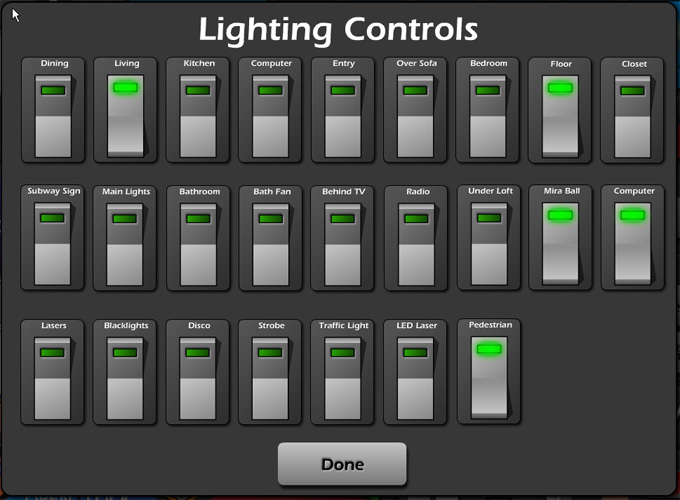 The "All On" and "All Off" buttons can be used to quickly turn all of the major lights ON and OFF. "Common" ON and OFF refers to the lights I use the most; that is, the ones that I normally have on when it is dark out. "Curtains Open" and "Close" controls the dark blue curtains you can see near the window. 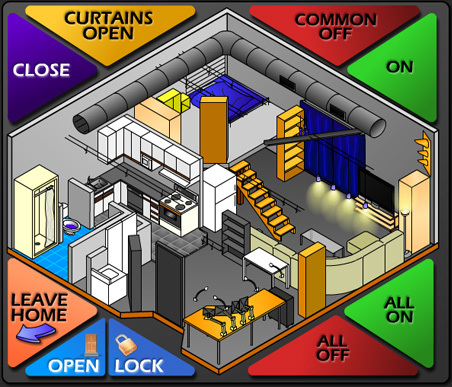 To learn more about the curtains, see the Automation section. The "Open" and "Lock" buttons in the lower-left control the automatic door opening device. I will write a section about this device soon (May 2010). If the monitors on my desktop workstation are still on, they are switched off. The system switches itself into "away", so that when I return, it automatically switches lights back on. Also, pressing Leave Home offers a choice of why I am leaving. 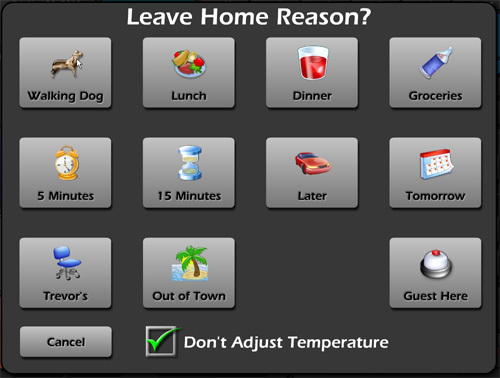 This allows any people who try to visit while I am away to be informed of the reason for my absence. It shows the same image that is currently showing on the TV itself, or, if the TV is off, the drawing shows a dark TV. In addition, each time the TV is turned on, a new random wallpaper is chosen and my LED Sign announces the name of the chosen wallpaper. This allows you to control the TV from the touchscreen. These controls allow me to adjust the current temperature in my apartment. This control works using the Home-Made Thermostat I made a while ago. 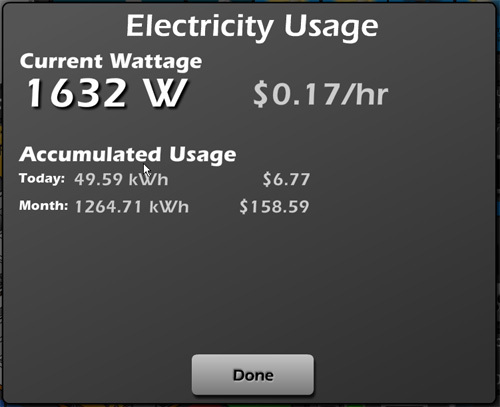 This feature lets me check how much electricity I'm using right now, as well as cumulative counts for the day and month. This works with the Power Monitor I built. The music controls offers one-touch access to my music library. 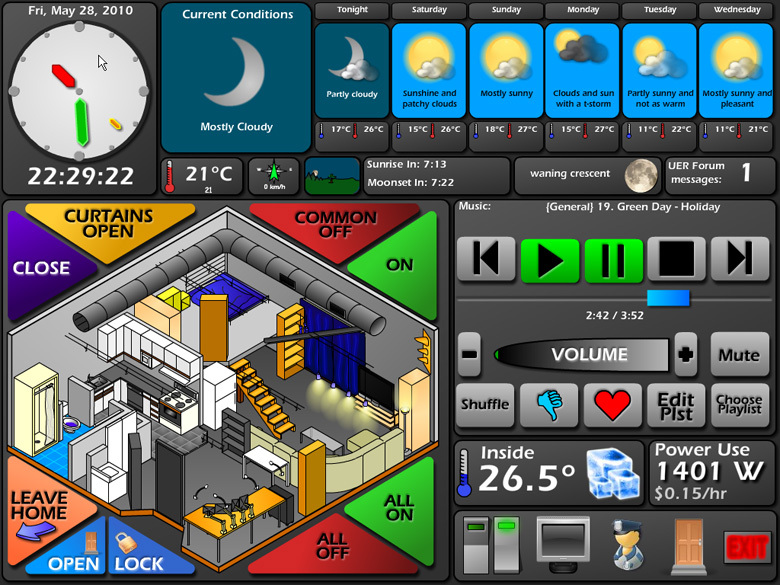 All the standard controls are there, including a scrub bar (the blue bar that indicates the current position in the song). 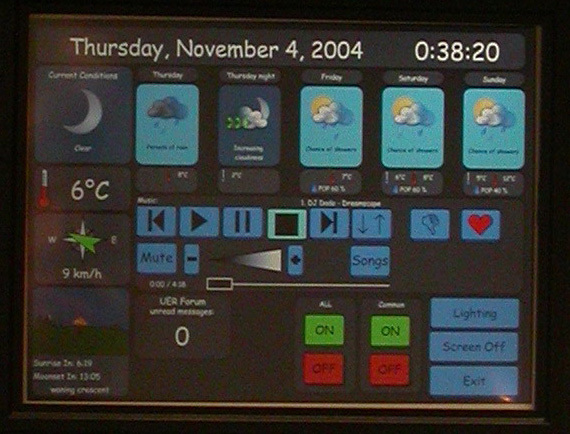 The touchscreen interfaces with the Media Center (See that section for more information). The "Thumbs Down" and "Heart" buttons are playlist controls. If a song starts to play that I really don't like, I can touch Thumbs Down. The song is immediatly removed from that playlist (and accompanied by a satisfying ZAP sound), and will never be played again. On the other hand, if I really love a song, I can hit the Heart button. The system will ensure I hear that song more often. The Edit Playlist brings up a simple, easy-to-use playlist editor, for quickly assembling a playlist. One of the excellent features of this editor is the on-screen touch keyboard, for instant searches through the song database. 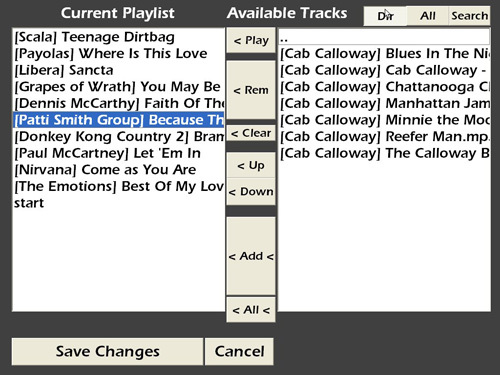 The "Choose Playlist" button can be used to select a pre-made, randomized playlist of a certain genre or category. For a more traditional lighting control environment, I sometimes prefer good, old-fashioned switches. On-screen ones, anyway! These switches operate exactly as you'd expect: Touch the top to turn it on, touch the bottom to turn it off. They also act as an indicator of the current status of various lights and appliances.